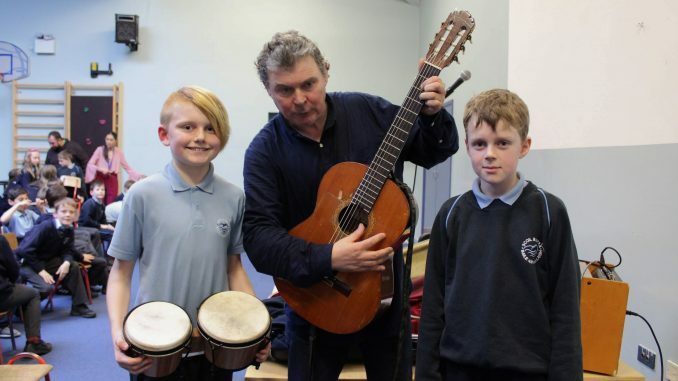 The pupils and staff of Scoil Barra were delighted when John Spillane came to visit on the 23rd of January as part of the Ballincollig Winter Music Festival. John played and sang along with Junior Infants to Second Classes who gave some rousing renditions of ‘An bhfaca tú mo Shéamaisín’, ‘I’ll tell me Ma’ and ‘The Rattlin Bog’. The Senior pupils then joined John and were enthralled by his musicianship and singing. Pupils from Third to Sixth Class were delighted to join in with some of John’s favourites including ‘Báidín Fheilimí’, ‘Beidh Aonach Amárach’ and ‘Trasna na dTonnta’. What an incredible afternoon, it was such a special event for pupils and staff alike. Thank you, John!